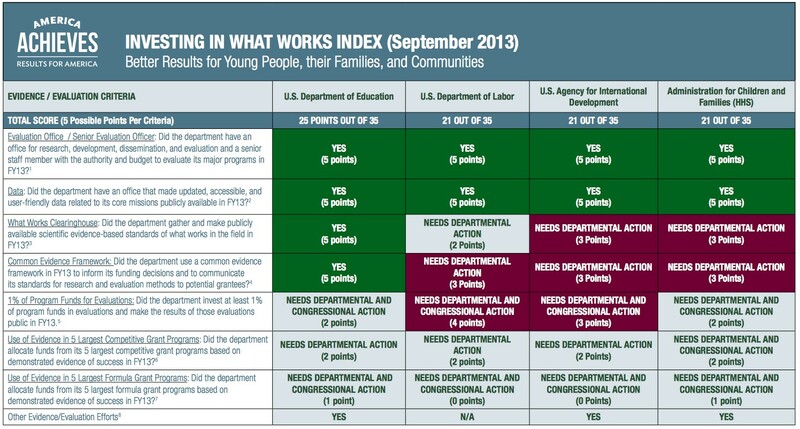 Results for America (RFA) recently released its second Invest in What Works Federal Index which describes how four key agencies and departments — the U.S. Department of Education, U.S. Department of Labor, U.S. Agency for International Development and the Administration for Children and Families (within the U.S. Department of Health and Human Services) — are increasingly using evidence, data and evaluation to help the federal government make better decisions and get better results. The Index criteria and scoring structure was developed by RFA, who consulted with more than two dozen evidence-based policy experts and practitioners all across the country. It is designed to educate the general public, as well as public, private and non-profit sector leaders, on how federal departments and agencies are currently using evidence and evaluation to invest taxpayer dollars in what works. RFA will continue to update and expand this index regularly to illustrate the government’s success at playing Moneyball.